We've been adopted!! We LOVE our new family. They have even blogged about us! Twice! Hello. 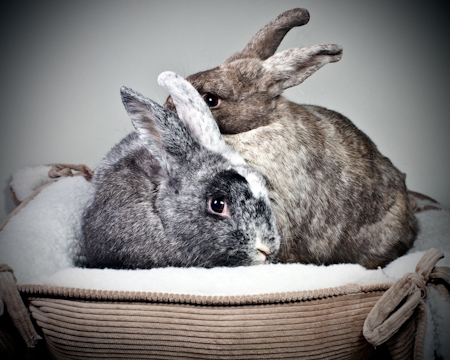 We are a STRIKINGLY glamorous bonded rabbit couple. All the volunteers stopped dead in their tracks the first time they saw us--- Glen with his beautiful white and black spots and Ava with her brown and tan markings. We are both a little shy, but we are very lovable rabbits! We were from the large group of 29 rabbits surrendered by one person at San Francisco Animal Care and Control. Despite neglect in our previous home we are really nice bunnies who are just a little shy. We are GORGEOUS bunnies and warm up quickly to a kind-hearted person. We're looking for a safe, loving, indoor home where someone will appreciate how wonderful we are! We are deeply in love, so adopt us together! We love to cuddle together and we'll keep each other company during the day while you are away at school or work.